Just the info i needed. I must say i´m impressed with the overall detail and workmanship. If the brakes work half as good as it looks, they are awesome. I will join you on the quest for 270 mm discs with the right offset. Nice walk through with the photos also. Did you swap your whole rear end or just do the disc conversion? Or did the US 320i come with rear disc?? My 318i still has drum in the back. I have 323i setup up front though. I swapped in 323i trailing arms and calipers. For pics of the process, check the yahoo photo link in my sig. I'm currently working on a cardomain page that will show it all, but its not done yet. jrcook320 wrote: I swapped in 323i trailing arms and calipers..
hehehe same.....well picking up mine tomorrow. 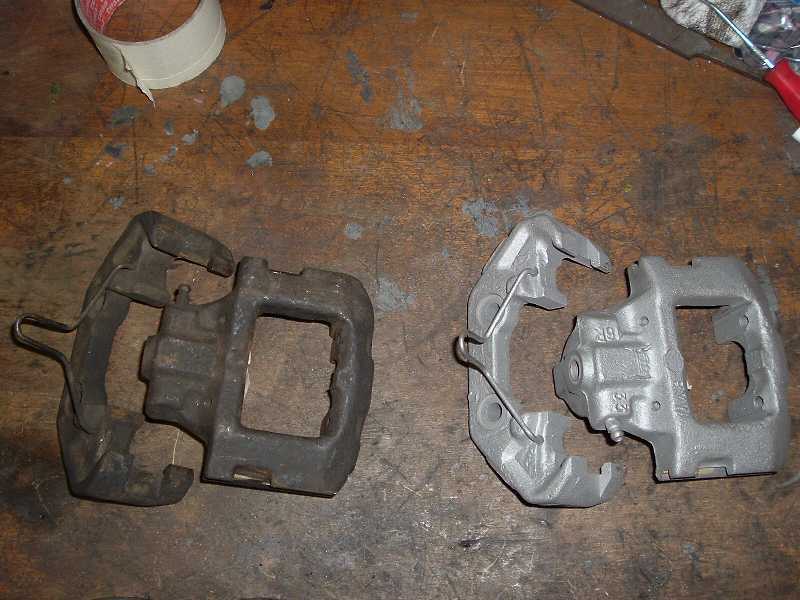 Girling Caliper - Left - cleaned up, right - as supplied, new old stock. 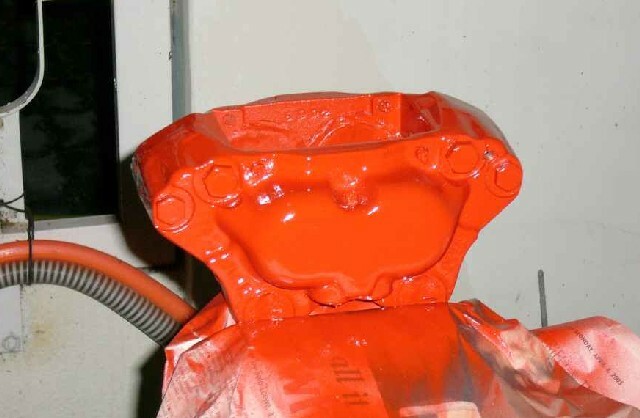 Calipers' paintwork need to be touched up. Will do when I have time. 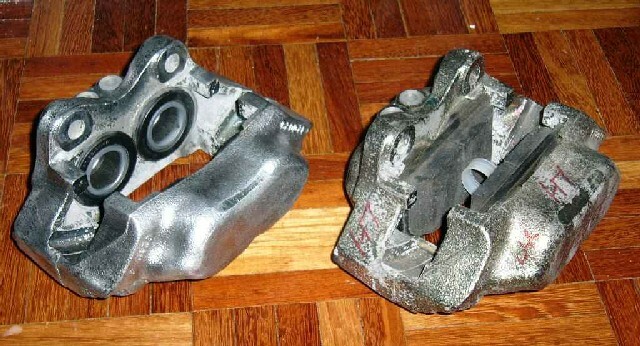 Here's a before and after pic of my rear calipers. They were crusty junk yard parts. I sand blasted and honed the bores before rebuilding and painting them. Thats cool, but they probably have drum parking breaks, so the hat dimensions would be all wrong, the rotor probably isn't vented, and the disk surface area is probably too small for the front pads. jrcook320 wrote: Thanks guys. Now all I need is 270mm rotors so I can push my calipers all the way out. Your brake system really looks nice. Great job. We have just purchased a 1979 e21 320i as a project car to launch our new Classic car catalog. As a final up grade I was planning on installing an m42 or m44 engine and trans. Any thought on that? Hope you don't mind me interfering here. If you want to make it something special why not fit the E30 M3's S14 engine? A relatively simple swap as the S14's bottom end is based on the 320i M10. Same engine mounts! Believe the US version delivers 185 HP, good enough. Probably not the cheapest engine to buy, but I've heard wrecked M3's go for abt $ 2-3K. That provides you with the right engine, wiring and gearbox. Depends on the damage of course but I heard a M3 with severe side damage leaving all vital parts in tact sold for 2K a while ago... something like that would be a great opportunity! Thanks Al. I'm no expert on the m42, but I've heard it said that the m42/m44 is the poor man's S14. Its a high tech motor, and you could probably rebuild one for the price of a S14 core. I personally would go with the m42 for the forged internals. The extra .1 liter displacement of the m44 isn't worth the hassle of obd2 and weaker internals. As for m42 over m20, it depends on what you end up doing to the m42. I'd like to see an e21 that is scary fast, much like your e30 RS m50. To do attain this with an m42 would require force induction. Of course, an NA stroker setup with independant throttle bodies would be awesome and would also carry over to the e30/e36 318i market, which might actually make it worth developing. Look forward to getting my classic catalog soon. Looking at your catalog... I just noticed you already have the multi throttle intake for the m42/m44. Now that would be cool in an e21. Why you dind't try with the 4 piston caliper of the e12? i have it and i will try to put them in my 323i. I didn't find any volvo 240 in the yunkyards. Dalaran wrote: Why you dind't try with the 4 piston caliper of the e12? i have it and i will try to put them in my 323i. I didn't find any volvo 240 in the yunkyards. Because they're much smaller and more expensive than the volvo girlings. Thanks for you answer, i think that you talk about the surface of the pad no? And wath about the brakin distributor? My car original was a 318i and i put them the 323i mechanical. When i put the rear disc brake i forgoten to change the braking distributor. Are de 318i and 323i BD similar? they are possible to be regulated? If the BD are not the same i will try to fit the e12 BD. that is something I would be worried about. 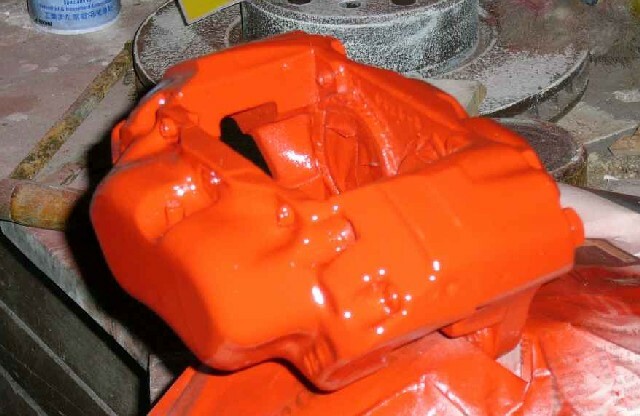 You don't want the rear brakes to lock up before the fronts do. Here we call the braking distributor a proportioning valve. On the first page there is pic of where I mounted an aftermarket braking distributor to bypass the stock one.